Reader Question: Advise On IHG Point Breaks Booking At IC Phu Quoc Resort – Paying US$130++ For Club Access? 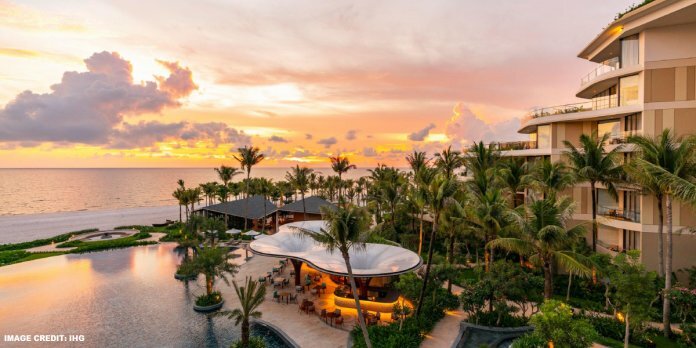 Today we have a Reader Question about the recently available Point Breaks property Intercontinental Phu Quoc, Vietnam where status benefits are given exactly by the book which means almost none. Having decent IHG Point Breaks properties on the list became rather rare in recent years and most of those that are actually somewhat interesting are now mostly classified in the category three, priced at 15,000 points per night. Our reader who is IHG Platinum Ambassador has communicated with the hotel to ask for eligibility to use the club lounge and was apparently quoted a completely irrational price. I sent an email to the Intercon Phu Quoc that was on pointbreaks as based on reports by other travelers in a Facebook Group they only give a simple one class upgrade and that’s it. I booked a week at this hotel and usually the elite treatment in Asia is much better than the bare minimum so I requested the price to pay if I want to upgrade to Club Intercontinental. I attached their response. The hotel replied that the upcharge would be US$130 plus tax and service charge per room no matter if it’s booked for one or two guests. This is totally prohibitive for one person, I could eat very well be it at their restaurant or room service for a fraction of this. In reality though I actually think about canceling the entire stay (I can cancel my flight free of charge as I booked with miles) and go somewhere in Thailand or Bali instead. Any recommendation? … Thank you for contacting us in regards to your reservation inquiries. The surcharge for breakfast is $25++/meal/adult. It seems clear that this resort tries to take clear advantage of it’s isolated location. Unfortunately the benefits at the Intercontinental for non-Royal Ambassadors aren’t as great as those that John received during his stay there. I’ve read a couple of those trip reports from the private Facebook group the reader sent us and wasn’t impressed. Pretty much one category upgrade and nothing else. To the question of the reader if another resort or destination would be better I’d say that’s a tough choice. Getting the IC Phu Quoc at 15,000 points is a great deal. I’d say 15,000 points is worth roughly $60-70 and the cheapest paid rate for this resort is ~$130++. As far as the incidental expenses are concerned you’ll have those at any other hotel as well. I’m personally not aware of any Intercontinental that would give free club access or breakfast to Platinum Ambassadors so going to Bali where I’m definitely sure that won’t happen isn’t a big improvement. Nevertheless Bali is a much more happening place than Phu Quoc. In my opinion the hotel should offer a better price if the reservation is for only one guest. The included airport transfer is not really worthwhile in terms of value when we’re talking about a multi-day stay. A week in Phu Quoc is a long time that can get a little boring but apart from that staying there under point breaks isn’t a bad deal even if one has to pay for food. To get a decent amount of Food & Beverage for one person per day I’d budget ~$60 and one could always get non-alcoholic beverages from a small convenience store as I’m sure nobody would spend the entire time at the resort. This is a good example that sometimes or actually most of the time a point breaks booking isn’t a super cheap deal though I’d argue that the all in value of paying the 15,000 points and around $60 per day for food isn’t a terrible value. Most definitely I wouldn’t pay US$130++ for Club access. The price could be somewhat justified if the room is occupied with two guests who both drink alcohol and consume that at the club.